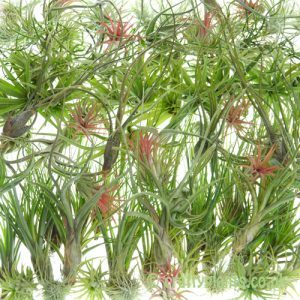 Some of the nicest varieties of Tillandsia, Ionanthas are neat compact airplants, perfect for smaller settings and provide some of the best foliage colour around flowering time. 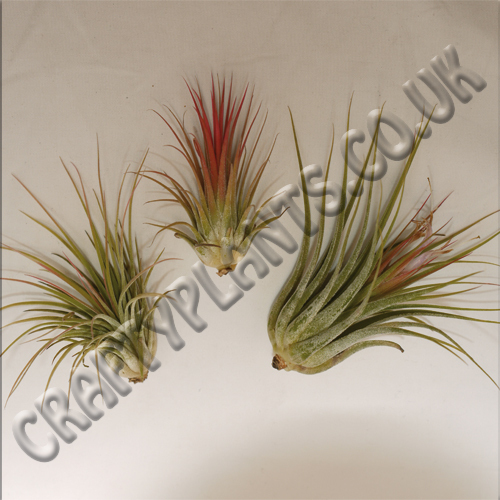 Collection includes 3 different named varieties of Tillandsia Ionantha type airplants from our range. Just wanted to say thanks for the great service Craftyplants! My order arrived really quickly and the plants were beautifully wrapped and in great condition. I will definitely be ordering from you again soon! 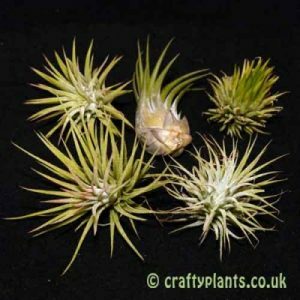 I agree with the other reviewer, what a wonderful experience shopping with Craftyplants! 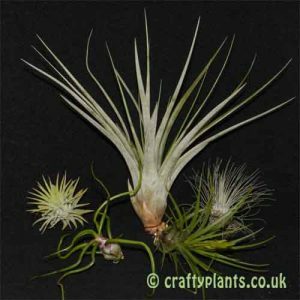 The plants arrived with such love and care, wrapped in green tissue and plenty of bubble wrap – it was a joy to open them. They’re beautiful plants, very healthy and full of babies (pups) too! They’re now happily living in my bedroom and I will nurture them with much love, they’re stunning plants. 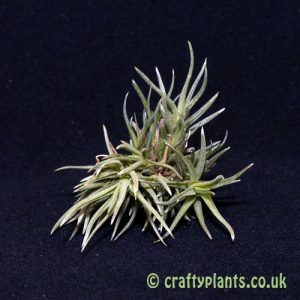 Thank you Craftyplants, I will definitely be back for more, what an amazing experience I’ve had buying from you. Thanks guys! Beautiful plants and they arrived in good condition. Thank you! Recieved my plants they are beautifull arrived very well packed and perfect big Thank you. 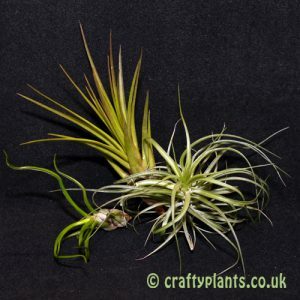 Bought this collection three weeks ago or so along with two other individual airplants. Came quickly in excellent condition and perfectly wrapped with very clear care instructions. 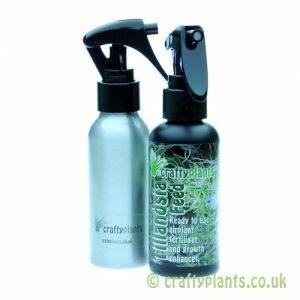 Also bought the spray mister which emits (rain)water in the perfect volume for the plants, and the feed pump. I recommend gently putting the plant ON ITS SIDE in a plastic spread container and misting directly down on it but conservatively. Then turn the plant over and mist again. 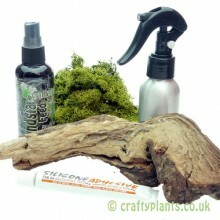 This prevents any water being applied directly into the ‘core’ of the plant, and is much easier than misting ‘in situ’. 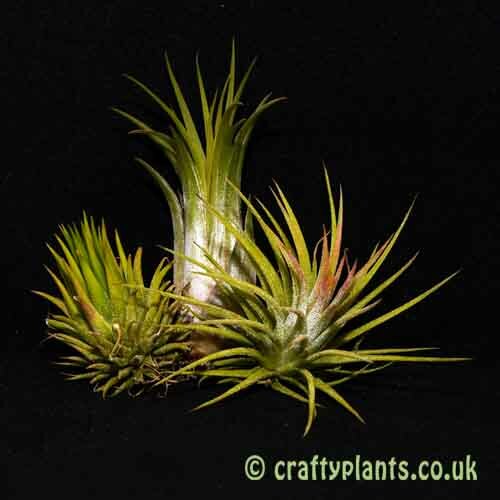 If larger water droplets are apparent keep the plant upside down on a piece of paper until dispersed and then place back in display container. Takes me less than 10 minutes to mist them all. It seems to work for me as the plants have already almost doubled in size and volume. I’m sure I’ll be ordering more in due course – I’m already finding it addictive!